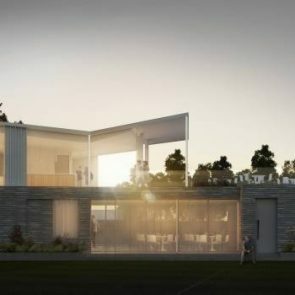 We recently installed a renewable energy system at this stunning new Tennis Pavilion in Southsea, planned to be the venue for future pre-Wimbledon tournaments. Timings were tight as the build only started last Autumn and had to be completed in time for the June Ladies Pre-Wimbledon tournament. In keeping with this modern, hi-tech building, our team installed underfloor heating on the ground and first floors, controlled by remote digital thermostats hidden in the plant room, so members of the public can’t access or alter them. With a substantial demand for hot water to supply the new shower rooms, we installed a 300 litre fast recovery hot water cylinder heated by the split system Daikin Air Source Heat Pump. The heat pump is well hidden in a concealed position outside, with the plant room housing an internal unit. With everything hidden from view in the plant room, there’s no evidence of any appliance heating the building whatsoever. With high levels of insulation in the building, heat loss is extremely low, so the Air Source Heat Pump we installed runs extremely efficiently and is only required as a heat top up as the most efficient part of the building is always down to the amount of heat that can be retained. The more efficient the building, the less fuel is required to run any appliance. Our team installed all the wet-rooms and cloakrooms with the highest quality sanitary ware, sourced from our network of high end manufacturers, giving a beautifully crafted finish. The official opening party was held in the Summer for local residents, keen to start using the facility and all the contractors involved in the build. With the feel and finish of a private member’s club, the Tennis Pavilion is available for anyone to use, just as the philanthropist who generously funded the project, intended.